High degree of innovation and a modern design. The Alko Highline 526 VSI is a powerful mower with easy electric start making for simple operation. With a cutting width of 51 cm (20″), the 526 VSI Highline petrol lawn mower ensures a fast progress even in large gardens (up to 1800 m²). The cutting height adjustment is carried out centrally in 7 stages from 30 mm to 80 mm. 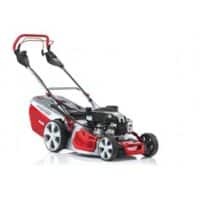 Thanks to the 2.6 kW strong Briggs & Stratton engine and the wheel drive (with variable speed control from 2.5 to 4.5 km / h) in combination with the XXL low-friction wheels, the mowing of the garden (even with a slope) can be completed effortlessly. The 4INONEfunction offers the mowing, catching, mulching and side discharge of the lawn. The optimal cockpit with easy-to-reach controls and the pleasant soft grip handlebar make lawn mowing a pleasure. The lawn cuttings pass through the extra high sheet steel deck with MaxAirflow technology to the rear into the 70 l large grass catcher with level indicator, which is filled to the top for less frequent emptying. The built-in handle on the front of the “Highline” lawnmower is ideal when it comes to transporting the lawnmower, storing using the upstanding function or in the garden to lift over steps or obstacles.